A buffer is a solution with a very stable pH. 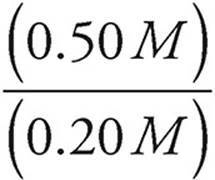 You can add acid or base to a buffer solution without greatly affecting the pH of the solution. The pH of a buffer will also remain unchanged if the solution is diluted with water or if water is lost through evaporation. A buffer is created by placing a large amount of a weak acid or base into a solution along with its conjugate, in the form of salt. A weak acid and its conjugate base can remain in solution together without neutralizing each other. This is called the common ion effect. When both the acid and the conjugate base are together in the solution, any hydrogen ions that are added will be neutralized by the base, while any hydroxide ions that are added will be neutralized by the acid, without this having much of an effect on the solution’s pH. 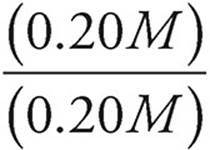 Let’s say we have a buffer solution with concentrations of 0.20 M HC2H3O2 and 0.50 M C2H3O2−. The acid dissociation constant for HC2H3O2 is 1.8 × 10−5. Let’s find the pH of the solution. 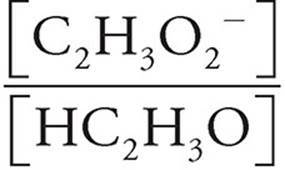 We can just plug the values we have into the Henderson-Hasselbalch equation for acids. 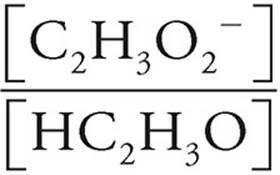 Now let’s see what happens when [HC2H3O2] and [C2H3O2−] are both equal to 0.20 M.
Notice that when the concentrations of acid and conjugate base in a solution are the same, pH=pKa (and pOH=pKb). When you choose an acid for a buffer solution, it is best to pick an acid with a pKa that is close to the desired pH. That way you can have almost equal amounts of acid and conjugate base in the solution, which will make the buffer as flexible as possible in neutralizing both added H+ and OH−. You cannot create a buffer solution from a strong acid and its conjugate, because the conjugate base of a strong acid will be very weak. Taking HCl as an example; the Cl− ion that is left after the acid dissociates completely is a very weak base and will not readily accept protons. The same is true for strong bases; you cannot form a buffer from a strong base and its conjugate for similar reasons.